It’s well known that Greenland contains a ton of frozen water—enough to raise sea levels by nearly 25 feet were it all to melt. Unfortunately, new research suggests melting may occur faster than we thought as the Earth warms, because of how Greenland’s glaciers are anchored to bedrock. A study published this week in Geophysical Research Letters finds that we’ve been underestimating how many of Greenland’s coastal glaciers are at risk of increased melting due to climate change—by a factor of two to four. 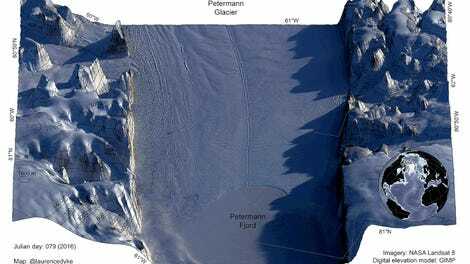 Scientists at UC Irvine, NASA’s Jet Propulsion Laboratory, and elsewhere reached that conclusion by constructing the highest resolution maps to date of Greenland’s coastal seafloor and bedrock. These maps reveal that many coastal glaciers are deeply rooted, making contact with bedrock more than 200 feet below sea level. Somewhat counterintuitively, deep-rooted glaciers are exposed to warmer water—3 to 4 degrees Celsius (6 to 8 degrees Fahrenheit) warmer than the waters chilling near Greenland’s surface, which hail from cooler Arctic sources. In order for these deep-rooted glaciers to lose contact with that warm water, Morlighem says, they have to retreat very far inland. This process will take a long time, suggesting that as ocean temperatures rise, Greenland will continue to lose mass for centuries to come. 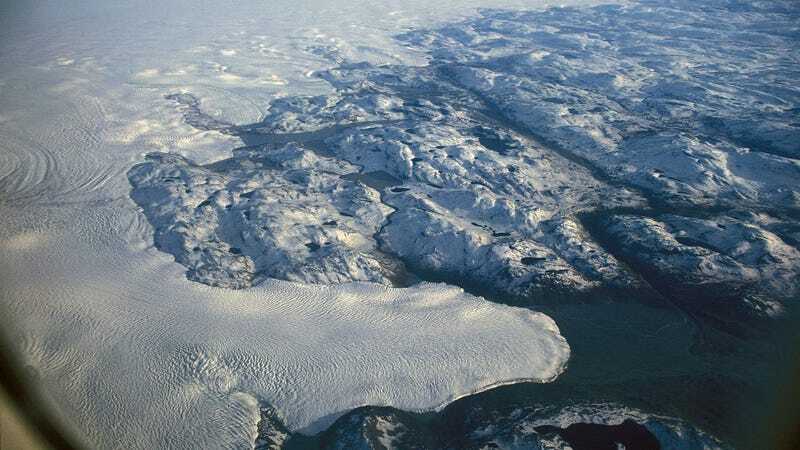 The analysis drew on data from NASA’s Ocean Melting Greenland (OMG) campaign, which includes aerial surveys of the ice sheet’s perimeter that measure changes in ice sheet height, ocean temperatures and salinity around more than 200 fjords where glaciers meet the sea. It also drew on data from NASA’s Operation IceBridge, another airborne survey that measures ice sheet depth. As glaciologists continue refining their models of Greenland’s future—and the future of coastlines around the world—climate change has already arrived to the vast icy island. Temperatures in the Arctic are rising at about twice the global average rate. A study published last year found that Greenland lost a whopping one trillion tons of ice between 2011 and 2014. Crucial ice flows, like the Petermann Glacier in northwest Greenland, are changing before our eyes, cracking up and spitting hefty chunks of ice into the sea. But if the new study is any indicator, the changes we’re witnessing now are quite literally the tip of the iceberg.